Plus: How Can You Get A Decent ROI With All Those taxes? Almost everyone has a mental image of what their dream retirement home or vacation home could look like. 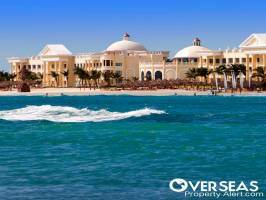 And this image often includes swaying palms, crystal-clear warm waters, and white sandy beaches. Throw in sportfishing, great food, and a funky Caribbean town, and you’ve got a picture-perfect retirement or second-home destination. This is exactly why Belize is so popular… it’s one of the few affordable destinations that fit that image perfectly. We hold a Live and Invest in Belize event each year, and it’s the only one of our events where we have to run two conferences—back to back—in order to accommodate everyone who wants to go. Belize is a Caribbean destination that doesn’t come with mainstream Caribbean prices. It’s close to the States at less than two hours from Miami. 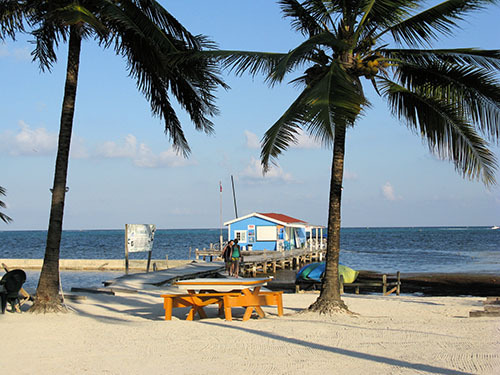 Property taxes are low, so the total overhead of owning in Belize is attractive. It’s naturally beautiful, with year-round warm weather, warm waters, white sand, and friendly people. Belize is a tourist mecca… and Ambergris is the biggest draw. Ambergris Caye (pronounced key) is a narrow, 26-mile-long island just off the coast of the Belize mainland. It accounts for almost two-thirds of Belize’s significant tourism income. Located squarely within the barrier reef system, Ambergris Caye is where most divers and beachgoers headquarter themselves while visiting the country. It has now won the #1 spot among the “top ten islands in the world” for two years running, per TripAdvisor’s Travelers’ Choice Award. 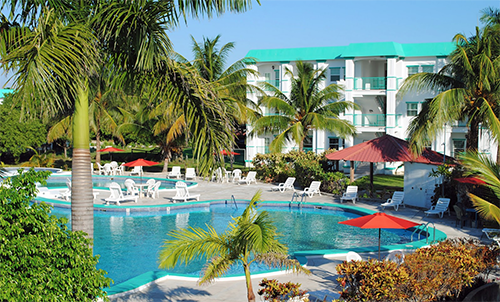 The climate on Ambergris Caye is warm and tropical all year. Average temperatures range from 75° in January (24°C) to 81° (27°C) in July. Most rainfall occurs between June and December. So for an investment in the tourism industry, Ambergris offers a lot. It boasts a mature tourism market, in a place that’s best-in-class, in a country that’s world-renowned for its diverse tourism potential… from exploring Mayan ruins to watching a giant manta work the barrier reef. In fact, on my last property exploration trip to Ambergris Caye, I spent more time exploring the reef than I did exploring the available properties. Affordable condos, rental income, and a special discount with financing. Baymen Gardens is a low-rise planned community, just a short walk south of San Pedro Town… it takes me about 10 minutes to reach the town center and just a minute or two to reach the nearest restaurant. The beach is a couple of blocks away, and you can even walk to the airport. The project is, in fact, next to the runway… but I didn’t find any objectionable noise. The four scheduled flights per day were small aircraft, mostly single-engine, headed for the mainland. Three buildings have already been completed and sold out at Baymen Gardens. The project so far includes one-, two-, and three-bedroom units that vary from around 500 square feet to 1,800 square feet. The entire complex—after building the pre-construction units offered here—will be just 54 units. At this time, the developer has a few remaining pre-construction units in the latest building, which has a total of only 10 condos. Construction begins on June 1, 2016. This building is designed primarily for those seeking cash flow, and the units are designed to appeal to the island’s active rental market. They’re perfect for someone who wants to spend a few weeks per year in Belize, and earn a rental income while they’re away. The condos are one-bedroom units and 486 square feet in size, with high, 10-foot ceilings. And as a special incentive, the developer is including upgraded stainless steel appliances, granite counter tops, a balcony… and furniture. Also at this time, the developer (ECI Development) is offering our readers a US$5,000 discount, which brings the price down to US$157,300. The price includes all closing costs, transfer fees, general sales tax (GST), and furniture. The going rate for one-bedroom rental units in Baymen Gardens is US$125 per night, and Baymen Gardens has a long-term, experienced rental-management team on site. Baymen Gardens is part of the larger Grand Baymen community, which also includes the San Pedro Club athletic facility (a pool, gym, and tennis courts), as well as the Exotic Caye Beach Resort and Grand Baymen Oceanside, a luxury beachfront hotel and condo project. When you become an owner in Baymen Gardens, you have access to all of the current amenities in the community, including its beach. Financing is now available on these units. You’ll need 50% down, and the interest rate is 6.9%, which is very low in the region. If you’d prefer, progress payments are available during the construction period, so you still don’t have to pay all at once. Here’s why I’m writing about this now. I got a call from developer Rachel Jensen this week with an update on the project, and a few things got my attention. One is that sales have been brisk, and it’s almost sold out. At this time, there are only a few units left. Also, the current price is only good until June 1, 2016, when construction begins. Further, the financing interest rate has dropped from 10% to 6.9%. And finally, she’s offering a US$5,000 discount to our readers. With the limited inventory, discount, and financing, I wanted to get the word out… especially because this is in Belize, which sees a high reader demand. Is Baymen Gardens for you? I think Baymen Gardens is a good option for those who want to generate an income abroad, while enjoying a vacation home on Belize’s Ambergris Caye. This particular offer at Baymen Gardens is not a good option for those who want to live full time on the island or spend long periods of time there; the units are a bit small for long-term living in my view. That said, they’re popular with pre-retirement buyers who want a “market placeholder” that will generate income and keep pace with the rising market until they’re ready to retire (and buy a bigger unit). Presently there’s a waiting list for monthly rentals at Baymen Gardens, so demand is good. Nightly rentals are also at an all-time high. There are only a few units left, and the pricing is only good until June 1, 2016. So if you’re interested follow this link to contact developer Rachel Jensen today. Am I missing something about investing in Colombia real estate? The tax on rental income is 33%. How do you get a decent ROI at that rate? For American taxpayers (Bob’s from New Zealand), you can credit any income tax paid abroad against your U.S. income tax. So your ROI would not be affected. I have two apartments that rented at an average of US$1,950 per month, with about 90% occupancy. Yet after the allowable deductions, I never reached the threshold that requires me to pay income tax. Had I reached the first bracket, it would have been 19%. This is because I’m a resident… something I recommend for any investor here. Colombia has the easiest residency I’ve ever seen, and as a property owner, obtaining residency is well worth the little effort that goes into it. I see you are back in Mazatlán. I would love to hear an update to your previous observations regarding buying there. I am located in California, about a 3.5-hour flight from Mazatlán. Compared to Hawaii, it is closer, with apparently better buys, and offers the adventure of a different culture. Good idea for an update. Earlier this year, I wrote a series of articles about Mazatlán’s historic center, as well as the historic center’s closest beaches, and the beaches farther to the north. And it just so happens that I’m closing on a property this Thursday, two days from now. I’ll write an update on Mazatlán for next week’s issue. Just a brief note to thank you for your thorough and thoughtful article about corruption, and its impact upon retirement overseas possibilities. Your experience is highly valued. Your category groupings of the Transparency International Index for countries in the Americas has also prompted my further suggestion about incorporating Portugal (ranked 28th) and Spain (36th) into either your Honest or Good categories. Thanks again for your clear thinking and complete response to this important area. Agreed. Generally, western European nations rank well when compared to much of the world. In this year’s Corruption Perception Index, the UK ranks high (honest) at position 10… with France, Portugal, and Spain also earning good marks.